This balanced new approach to maintaining sinus health is healthy and effective. When sinuses get irritated due to pollution and allergens they can close off. This makes them very difficult to access and your immune system will be working overtime. You need Sinus Relief™. It is extremely important to promptly use Sinus Relief™so that it can reach deep into the passages to encourage a healthy sinus system. 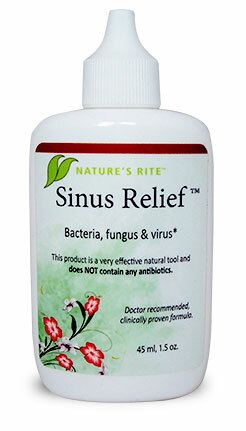 You can order a bottle of Sinus Relief™ and be on your way! Inexpensive– the benefits of Sinus Relief™ far outweigh even the very modest price. Unequivocal value! Just what you need– treating the problem is the answer. It’s nothing more than exactly what you need. No overkill, no collateral. Portable– It fits in your pocket, and can go with you everywhere. Convenient– take ten seconds to spray and enjoy the benefits! Just carry it in your pocket and spray it every 20 to 30 minutes. Works great in conjunction with Sinus Support™ and Congestion Relief™. Keep your sinuses healthy all year round with Sinus Relief, Sinus Support, and Congestion Relief. 35 ppm pure aqueous colloidal silver. There’s nothing simpler than Sinus Relief™!